Seven $0 Tools to Help You Automate Your Empire, Work Smarter, & Create the Life You Want! 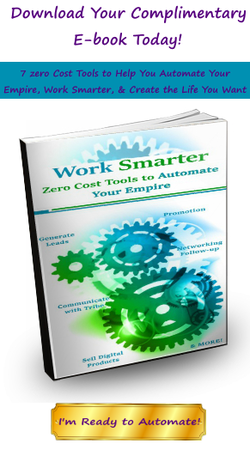 You can expect this e-book to give you simple tools to help you work smarter. There's something in here for you whether you're in the startup phase or a seasoned business owner. Also, whether you have a brick-and-mortar or work from home. The best part is that these tools are F-R-E-E. To build a successful empire, you must keep your overhead low and your profits high.